The sun is a huge sphere of hot gas primarily composed of hydrogen (74.9%) and helium (23.8%) and lesser quantities of other gases. 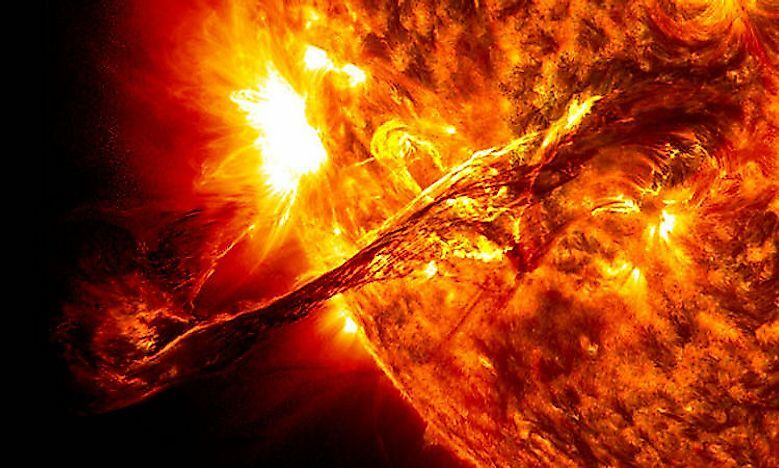 The sun is a hot ball of gasses that would burn all that approaches it, making space missions to the sun impossible. Every morning the sun has risen, without fail, for billions of years and every night it has hidden behind the horizon. The sunrise and sunset have been two of the greatest mysteries for ancient civilizations, who worshiped the sun and made it God. It is and has always been the most important source of energy on earth, providing warmth and promoting agricultural growth. Scientists once believed that the sun revolved around the Earth, now it is common knowledge that the sun is at the center of the universe. Today, scientists know far more about the sun and its composition than what was known just 100 years ago. Located over 93,205,000 miles away, the sun is so bright that people cannot look at it without hurting their eyes. It burns at a temperature of 9,932° F on its surface, making it impossible to plan a landing mission. Its diameter is 109 times larger than Earth’s, and it weighs 330,000 times as much. In total, the sun makes up 99.86% of the mass of the solar system. What Does The Sun Look Like Inside? Researchers have determined that the sun is made of 6 components. The very center of this star is called the core. The core has the hottest temperatures. Surrounding the core is the radiation zone which can trap energy for long periods of time. The convection zone, the last physical layer of the sun, surrounds the radiation zone. Outside of the convection zone are three layers of the solar atmosphere. The closest atmospheric layer to the sun is the photosphere which is what humans can see from the Earth. The final two atmospheric layers are the chromosphere and the corona. So what is the sun made of? Turns out, the sun is made up of several gasses. Hydrogen makes up 72% of the mass of the sun, helium another 26%, and the remaining 2% is made up of oxygen, neon, nitrogen, carbon, magnesium, silicon, and iron. All of these elements come from the core of the sun where the temperature is approximately 27 million degrees F. This extreme temperature helps create an extreme pressure in the core which pushes the elements to the surface. During this process, hydrogen atoms undergo nuclear fusion which forms helium and energy. This energy forms gamma-ray photons and neutrinos that remain in the radiation zone of the sun for hundreds of thousands, even millions, of years. These gamma-ray photons and neutrinos eventually move into the outermost layer of the sun, the convection zone. Because the temperatures are cooler at this layer, the previously mentioned elements trap in heat and create a boiling plasma. This boiling process releases the energy into the atmosphere. The energy reaches the surface of Earth as sunlight 8 minutes after its release. One of the most important scientific instruments for studying the sun is the Super-Kamiokande (Super-K) detector in Japan. Located 3,280 feet below the surface of the earth, where it collects neutrinos that pass through the air. Studying these neutrinos allows scientists to understand what the sun is made of and what it is experiencing in real time.